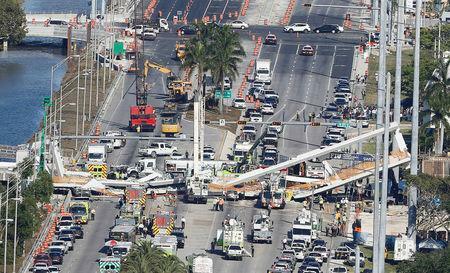 MIAMI (Reuters) - Engineers and state and university officials met hours before a new pedestrian bridge collapsed in southern Florida, killing six people, but concluded a crack in the structure was not a safety concern, Florida International University said on Saturday. The meeting on Thursday involved FIGG, which is the private contractor for the overall bridge design, the school, Florida Department of Transportation officials and Munilla Construction Management, which installed the $14.2 million bridge. Police had feared the death toll could rise above six. But authorities found what they believe to be the last body on Saturday, Miami-Dade Police Department director Juan Perez told a news conference. "We're going to go once again and make sure that there's nobody else down there, but we're pretty confident that no one's left," he said. Four of the victims found on Saturday were identified by police as Rolando Fraga Hernandez, Oswald Gonzalez and Alberto Arias and Alexa Duran. The name of another person whose body was removed from the rubble Saturday was not immediately available. News of the meeting between engineers and officials followed a revelation late on Friday that the engineer overseeing the bridge, which linked the university campus with the city of Sweetwater, had called a state official two days before the collapse to report cracks. However, the voicemail message from FIGG's lead engineer Denney Pate, including his assertion the cracking posed no safety issue, was not retrieved until Friday, a day after the tragedy, according to the state transportation agency. Pate did not immediately respond to email queries.